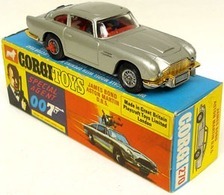 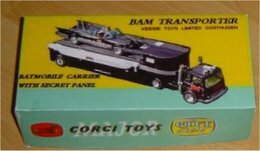 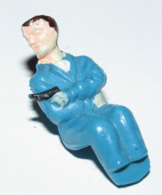 This was the first Corgi James Bond tie-in model and the company’s second character toy after The Saint’s Volvo. 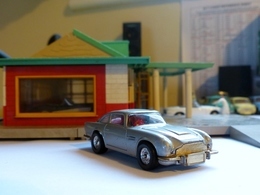 The tooling for this model was developed from that of the existing Aston-Martin DB4. 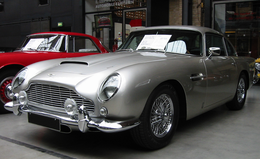 It was incorrectly finished in gold (where the real car was silver) because the bumpers and grille were cast-in and could not be picked out in silver (as was customary for Corgis of the time) if the model itself was silver. 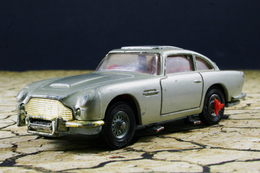 Also, when painted silver the model looked as if it had not been painted. 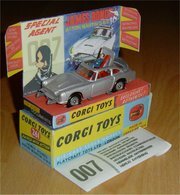 It featured a working ejector seat, extending front machine guns and over-rider rams and rear bullet-proof shield and came with instructions, two ejectable bad guy figures, a lapel sticker and James Bond driver figure.